ASME A13.1 has incorporated the GHS pictograms into the new 2015 revision and has recommended their use as part of the legend. "The applicable GHS pictogram as illustrated below may be included as part of the legend. Where piping is connected to containers that are labeled in accordance with GHS requirements, a corresponding label on the piping may be provided. The corresponding label should contain at least the product name or identifier, the pictogram, the signal word, and the physical, health and environmental hazard statements." Nine OSHA approved Hazard Communication pictograms. 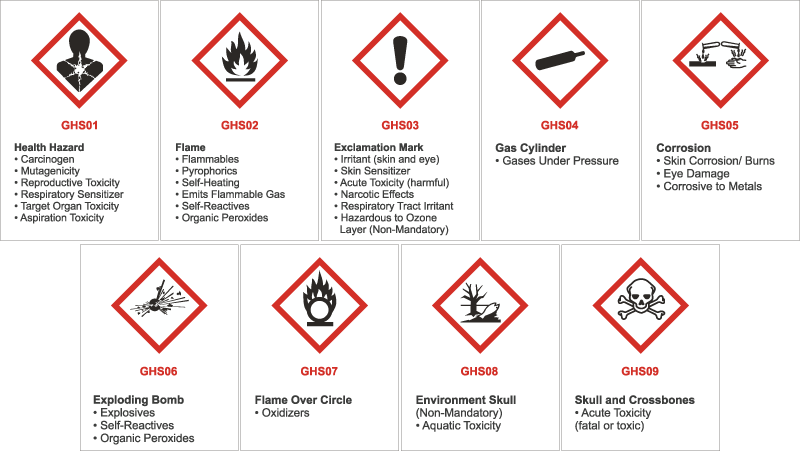 Each pictogram below is used to alert users of the chemical hazards to which they may be exposed to. The pictogram consists of a black symbol inside a white diamond framed by a red border and each represents a distinct hazard. From no symbols, or up to 6 different symbols can be printed on each marker, depending on the substance you need to identify. The symbol printed on the marker is determined by its chemical hazard classification. Reference the company's SDS sheets to learn about the hazard classification of each substance you will be exposed to. 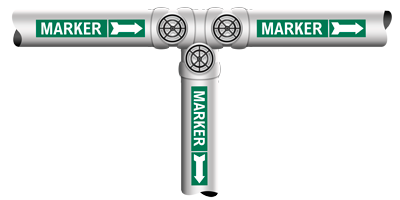 Markers comply with the new ANSI / ASME A13.1 2015 standard if used in conjunction with arrows. The following chart shows the recommended pipe marker letter height and marker size based on the outside pipe diameter of the pipe to be identified. For pipes smaller than 3/4" and for valve identification, the use of a permanent legible tag is recommended. The secondary means of identification is the color code of the marker. The exact colors are contained in the ANSI Z535.1 Safety Color Code. Color is the secondary means to identification but many times the most important. The color of the marker should be used to identify the characteristic hazard of the contents of the pipe. The following chart list the classifications shown by ANSI / ASME A13.1 2015 as the suggested color combinations for the pipe markers. Install pipe labels near branches and whenever a pipe changes direction. Install pipe labels at frequent intervals on straight pipe runs. Arrow Tape & Premium Banding Tape are 30 yard long while Economy Grade is 36yrd long. Most will apply tape on both ends of the pipe marker resulting in 2 bands per marker. Table Provides the quantities of bands for a specific O.D., not the quantity of markers. Be sure to include pipe insulation in size selection. Pipe Diameter O.D. 1" 2" 3" 4" 5" 6" 7" 8" 9" 10" 12"